The scope of the visual arts has grown over time. In addition to traditional drawing, painting, and sculpting, students learn about things like architecture, folk arts and crafts, computer graphics, and mass media production. Why study the Visual Arts? The arts are a result of the unique ability of the human mind to make connections among the basic skills in social relations, natural science, technology, and language. Students learn to integrate knowledge and processes from many subjects to create and understand the world around them. Research has proven that involvement in the arts improves academic test scores. Students will study and analyze different artists and styles of art. Students will create and utilize a range of subject matter, symbols, and ideas in their work. Students will understand and apply art elements and principles of design in their artwork. Students will utilize skills and techniques in a variety of two dimensional and three dimensional art to communicate personal meaning. Students will reflect, revise and refine work in problem solving and critical thinking skills. Students will reflect about their experiences and processes in art. Students will use the life skills of respect, responsibility, cooperation, common sense, problem solving, and pride in order to create a fun, safe and creative environment. Each student has a job to complete each day to ensure the materials get put in their proper place so the art room stays clean and organized. 1. Be prepared for class everyday with assigned art materials. 2. Stay in your assigned seat. 3. Stop and listen to announcements. 4. Follow teacher's directions and instructions at all times. When the teacher is talking you are not. If you have a question or comment you should raise your hand and wait until called upon. 5. Be respectful! Respect your peers, materials/school property, Mrs. Esposito, and most important, yourself. 6. There will be no running, throwing objects, or "horse play" in the art room. 7. Clean up your area and put materials and equipment in proper area before leaving the art room. Students are expected to come to class on time and prepared. Respect is a must! Respecting the feelings and artwork of others is absolutely mandatory. Students will care for tools and materials and clean up at the end of each class period. Horseplay will not be tolerated for the safety of everyone. Students should do their best work ALWAYS! A positive attitude and an open mind are a must! As an art educator I believe that art gives students the ability to communicate emotions, imagination, and environmental awareness through visual art production. 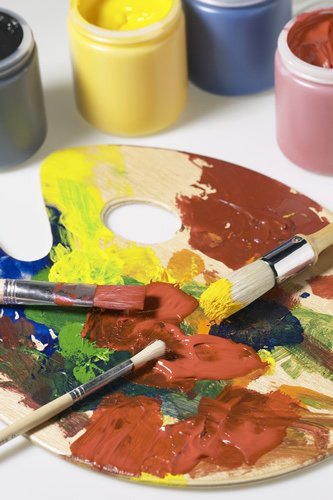 Visual art is a complex discipline that is composed of numerous elements, principles, and skills, which can and should be taught in ways appropriate to a child's cognitive stage and physical abilities. It is important for an art teacher to model appropriate methods, techniques, and attitude towards their students. As an art teacher, I provide my students with the necessary knowledge to take pride in expressing themselves creatively. I teach my students to value and respect their peers' work as well as their own. It is important for students to learn the value of originality and honesty. Art surrounds us constantly and it is critical for students to recognize images and incorporate aesthetic understanding to their daily lives. Art allows students with different learning levels and styles to succeed in a medium other than the academics. My goal as an art teacher is to enhance artistic development in my students and to act as a resource and guide. Students will be able to interpret art critically, and develop their own personal style. As an art educator I hope to stimulate the creative process by teaching my students technique, art history, free expression, as well as multicultural art. Creativity builds on intelligence, provides emotional, and creative growth, and I hope to educate my students to take pride in their accomplishments. DON'T THROW IT AWAY, SEND IT TO ME! As you might expect, tight budgets force us art teachers to be "pack rats"! I am always in need of the following items: Water based paints, paint brushes, large shirts or aprons I can use as smocks, newspapers, magazines or books about art, clean cans or jars with lids, drawing paper, easels, canvases or canvas boards, frames, bookcases, desks, tables, office chairs with castors, colored pencils, and any sort of drawing tools. If you have any of these items cluttering up your house, bring them to me before you bring them to the dumpster! 2) Students this age are often shy about sharing their artwork. I encourage students to bring their work home, but all too often they throw it away instead! If your child is in art class, remind them to bring their work home so you can admire it! Please keep in mind I like to hang your child's art in the hallway so it might take some time to come home!